Harvard’s Jade Miller became the second Ivy athlete to score a berth in the 2014 World Junior Championships final last night. 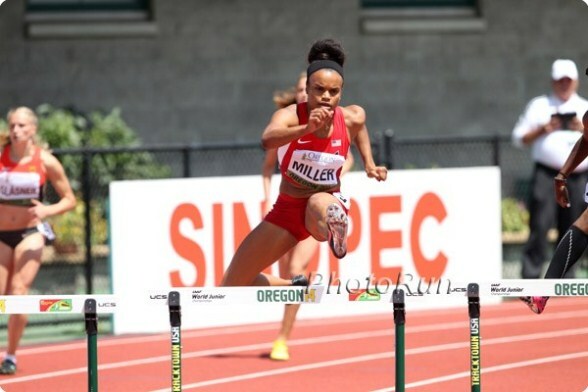 In the 400m hurdles semifinals, Miller finished 2nd in her semifinal heat behind Great Britain’s Shona Richards (57.08). Miller’s time of 57.28 is just shy of her seasonal best of 57.22. The finals will be contested tonight at 7:10pm EST. Now, she was listed on the provisional 4×400 relay pool list for Team USA so she could be running the relay preliminary round tonight at 6:05pm EST. However, given that she has the 3rd fastest 400m hurdle time coming out of the semifinals, I believe that she might skip the 4×400 relay tonight in order to be fresh for the 400m hurdle finals. Our other 2014 World Junior Championship finalist, Harvard’s Nikki Okwelogu, finished her championship campaign last night. She finished 11th in the shot put final with a best throw of 14.77 meters (48-05 1/2). The championship was won by China’s Tianqian Guo with a throw of 17.71 meters (58-01 1/4). Okwelogu’s athletic season is not over – she is set to compete at the African Championships in Marrakech, Morocco on August 10th to 14th in both the shot put and discus throws. Joining her at this meet will be her Nigerian teammate, Cornell’s Stephen Mozia (who will be competing next week at the Commonwealth Games). The men’s 4×400 relay preliminary round will also be contested tonight. Cornell’s Jordan Sherwood is listed on the Team Canada relay pool, so keep an eye out for him tonight, starting at 6:35pm EST. This entry was posted on Saturday, July 26th, 2014 at 9:58 am. It is filed under Athletes. You can follow any responses to this entry through the RSS 2.0 feed.